This time, I'm going to avoid the wrestling match with prosealing the ribs into the right fuel tank. This jig will hold the tank at an angle to allow me proseal in the ribs more easily. I went to Lowes (aircraft and lumber supply) and bought these steel angles. I cut 4 pieces from the long angles and put 45 degree angle cuts on the ends of each. 2 of them are shown here. I made sure that this 1 x 12 was straight and level to avoid twisting the tank. I made sure to position the jigs to where they won't interfere with riveting the ribs. I positioned these lower angles to where the upper angles won't interfere them. I used regular washers and lock washers on the bolts to make sure the upper angles don't shift to easily. Yep, this is gonna' work! It should free up a hand to make riveting and prosealing easier. I could see right away that the end of the 1 x 12 would interfere with the rivet gun on the bottom 3 rivets on the top side of the skin. So I cut off the ends. I will shift the tank left and right in the jig to put in these rivets. 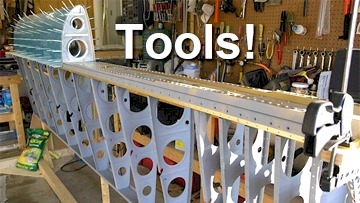 All of the ribs but the center one will be accessible by shifting the tank left and right in the jig. I made this cut-out on the 1x12 to allow me access to the bottom 3 rivets of the center rib on the top skin. The bottom skin will be easy to get to, so no cut-out will be needed on the other side.